Danielle Waugh (DW): Coach Boeheim, thank you for being with us for five questions with CONNECT. First I wanted to ask you: to people outside of the Syracuse area you are the most recognizable person, you’re essentially the face of our area. So how does that affect you, and why? Jim Boeheim: Well that’s pretty sad. Oh I don’t know, I think people have followed our basketball program for a long time. So I think when you go outside, people tend to identify with Syracuse through our basketball program because we’ve had so many teams and so many games on television I think. DW: Outside from being the basketball coach here, you’re also really involved in our charities. You’re involved in Coaches vs. Cancer and you also started the Jim Boeheim foundation. How has that affected you and why are those things so important to you? Boeheim: Well I believe you have to give back to the community. Our community has supported our basketball program as well as any community in the country. So in turn for that we have to give back, and Coaches vs. Cancer and the Kidney Foundation and Make a Wish are some of the vehicles we’ve used. With our own foundation we’ll be able to give to a lot of different local groups because we’ll be able to raise enough money hopefully to give back to several different groups. Some of it will be cancer related and some just to help kids in Central New York. DW: On a more personal note, how would you describe yourself as a father? Boeheim: Well it’s a lot of work, I know that. I have an older daughter, 24 years old, who was really pretty easy and not a hard child to raise. Now I have three that are 11 and twins that are ten and it’s a challenge. I know see how being a parent is much more of a challenge than I originally thought it was with my first daughter. But it’s fun, it’s a lot of activities and a lot of good things that go on every day and a little bit of craziness. DW: You’ve been here for a while. You went to school here, you played basketball here in the 1960s. How have you seen our school, but also our community, change over time? Boeheim: Well I’ve always loved the community and the school. I came here in 1962 as a player and I never left. I stayed as an assistant coach and was able to get the head coaching job. I love Central New York, I think the people are great. I think the people really care about the community. I think people are willing to get in and get involved in work and with charities. Everything we’ve ever done we’ve had support. People have supported us 100 percent. It’s a great place to live. I believe that. DW: What about you, how have you changed since back in the 1960s? Boeheim: Well, I’m a lot older, a little slower, more aches and pains. But you know, in coaching the thing I think is you start over new every year, you really do. So in a lot of ways it feels like your first team. You know, this is a brand new team this year, we’re 0 and 0, where are we going to go? So you really kind of start from scratch every year. And it kind of makes it almost seem timeless, it doesn’t seem like you’ve been coaching a long period of time. It kind of seems like this is your team, this is the year. So from that point of view I feel very similar from when I first started coaching. DW: Even though so many people know your name and even though you’re so recognizable there has to be something people don’t know about you. So what would people be the most surprised to know about Jim Boeheim? Boeheim: That’s a tough question. Um, I don’t know. I watch a lot of soap operas, the night time soap operas–Grey’s Anatomy and shows like that. You probably wouldn’t think that. But I do I watch a lot of television to kind of get away from the game. I like movies, old movies. I don’t get to many movies now because the only movies I get to are kid’s movies, but I like old movies and television. I don’t think people know that much. I like to fish. I don’t get a lot chances, but I do like to fish when I get the opportunity and hopefully some day I’ll get a little bit more opportunity. 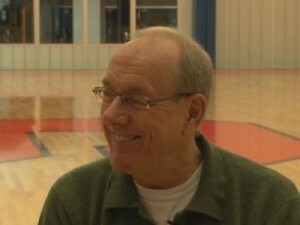 DW: Coach Boeheim, thank you for being with us, this has been 5 Questions with CONNECT.